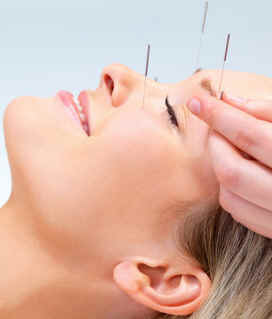 Acupuncture | Your Health. Your Lifestyle. Acupressure is based on the same concept as acupuncture, but without the needles. Instead of inserting needles, you apply pressure with your fingers and hands on meridian pathways to restore the normal flow of energy, or chi. One of the best things about acupressure is that you can practice it on yourself. It is great for stress-related problems, like headaches, muscle aches, fatigue, insomnia, anxiety, motion sickness and constipation. 1. To massage an “acupoint”, apply steady, firm pressure for about thirty seconds with your thumb, finger, elbow or palm. 2. Steadily press deeper for up to three minutes and then release and move on to your next point. If you can’t reach an area (your back, for instance), you can lie on a massage ball or a tennis ball, but go easy. If the acupressure point is really sore, you want to go very slowly. 3. If you have difficulty locating an acupoint, move your fingers around the area until you find where it is sensitive. Using the thumb and forefinger of one hand, pinch the webbed flesh between your thumb and forefinger (about an inch and a half in from the edge where the thumb and forefinger meet) of your other hand. Massage the point for two minutes. Then do the same on the other hand and repeat three times. This technique is also good for sinus ailments and toothaches. Put your right forefinger on top of your shin, just below your right knee, and then rest your other three fingers on your leg. Your pinkie will come to rest on a very powerful stomach point. When you press slightly, most likely the area will feel sensitive. Press firmly for one minute, take a break and do this three more times. Change to the left leg. Do small circular movements on top of your foot two finger widths down from your ankle and between your big toe and the second toe. It will feel tender. Apply pressure there with deep strokes. This technique is also good if you have sore feet! There are a few points that relieve these symptoms. This is an easy one. On the inside of your leg, measure three or four finger widths up from the ankle toward the knee. You will notice that this area is tender. Apply pressure for a minute and then release. Do this three times and repeat as needed. Acupuncture has been around for thousands of years and it really works. Acupuncture has to do with energy, or chi, in the body. Energy flows along pathways (meridians) in your body. Each pathway corresponds to one or a group of organs in the body. When illness or injury occurs, the chi backs up. If the chi is moving too fast or too slow, it can cause disease. The acupuncture needles are inserted along the meridian pathways, at points where the pathways are close to the surface of the skin. The needles release the chi to restore it to its normal flow and your symptoms are relieved as the chi moves smoothly around the body again. The FDA considers acupuncture needles to be medical devices and they are regulated in the same way as other sterile medical equipment. Medical researchers have found that acupuncture stimulates your immune system and your nervous system to release endorphins, which are your body’s natural painkiller. It also causes your body to release other natural chemicals, such as hormones, that regulate your body and control symptoms such as pain and swelling. Acupuncture and acupressure therapies aim to restore balance when the natural flow of energy, or qi (chi), thought to support wellness, is disrupted or blocked. Many people report relief from pain and other symptoms after sessions, which stimulate activation centers at various regions to reopen meridians (12 channels believed to connect specific organs, creating a communication system throughout your body). Research seems to back up the claims, finding that conditions like depression, lower back pain, migraines, even nausea can be alleviated with acupuncture or pressure. You can massage trigger points that are believed to stimulate emotional wellness, promote physical health, and curb pain. Gently pinch the soft webbed area between your thumb and index finger to help relieve stomach or intestinal problems and headaches. Use your index and middle fingers to apply pressure at the base of the inside of your wrist, in between the two large tendons, to relieve symptoms of nausea. Stroking downward toward the hand along this spot may also settle anxiety and insomnia. Apply pressure with your thumb on the notch about 3 finger widths above your inner ankle bone at the base of the calf muscle to ease menstrual cramps, urinary or digestive problems, and emotional stress. If you’re pregnant, or have a bone disease, varicose veins, or rheumatoid arthritis, talk to your doctor; acupressure therapies may not be appropriate. PCOS is a common condition. PC stands for polycystic, O is for ovary, and S is for syndrome. It is a syndrome because it consists of several features, including obesity, unovulation or infertility, and abnormal periods in the form of no period at all, skipping periods, or sometimes heavy, irregular periods. There is actually no specific treatment because, it is a multi-faceted condition. When a patient comes to you, she comes in for a particular complaint. For example, infertility — that’s a reflection of unovulation. We focus in on how to make the patient ovulate, if she is interested in pregnancy, obviously to enable her to ovulate and get pregnant. Now, the other symptoms like obesity, we deal with it the same way that we do with any type of obesity. What is the underlying cause of PCOS? What causes all these symptoms? There is no answer yet, but if we look at it endocrinologically or hormonally, there is a problem with the LH production. In other words, there is increased LH production, and that causes a repercussion in the ovaries. This will cause the ovaries to produce more testosterone. The testosterone manifests, and it cuts off the rhythm that induces the ovulation. Why use acupuncture for a condition like this? First of all, it has been used in other countries, such as China. It has been successful, so the reason why we attempt to use acupuncture is to stay away from medications. Some of the medications may not be as harmless as we think they are. Some patients are recalcitrant, or not responding to medications. Also, some medications can cause side effects that are worrisome. Therefore, if we can prove that the ovulation can reduce PCOS in patients, then we will not subject them to the rest of the possible side effects of the medications. What is unique about the points you choose when treating a patient? We have to go back to the theories behind acupuncture. 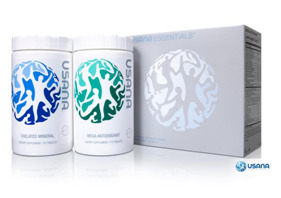 Basically, there are specific points on the body that have special functions. If treating PCOS, I will be using those points that have been found to be helpful in gynecology. These points are actually only a manifestation of the energy on the particular meridian, or channel. I would be using the meridians that have affinity to the reproductive system. Treating a headache requires different types of meridians, and there are various types of headaches, so again it all depends on the person and his or her problem. In a nutshell, women should realize that acupuncture can be very helpful in many gynecological problems. It can be used as an adjunctive treatment for patients who still use the traditional methods, including medication and surgery. They should investigate the possibility of using it for the pain, for the infertility, for PMS, and for menopausal symptoms. Acupuncture has been helpful. You’ve heard of acupuncture, where doctors stick needles in a patient to treat pains and illness. But have you heard of acupressure? Instead of those sharp needles, it’s as simple as using a finger to press on special pressure points to relieve pain. Learn some pressure points that might help you, and decide for yourself if it works. 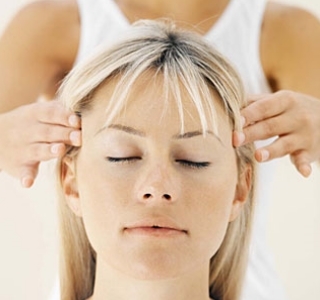 Acupressure – A form of medicine that’s been around for five thousand years. Acupressure usually is the same as acupuncture. Acupuncture by needle… acupressure by hand, by finger. 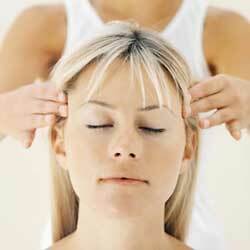 The Chinese believe energy, called Chi, travels the body through channels. Massaging pressure points can open those channels and relieve pain. As a gardener, Margie gets many aches and pains. She comes to Dr. Lee for instant relief. “Every place he touches you there’s like a little spark of energy,” she says. He even shows patients how to treat minor problems themselves. For instance, pressing here on the hand is used to treat a sore neck…toothaches…and headaches. This point on the wrist is thought to relieve motion sickness and dizziness. Gently rubbing an area on the leg is believed to ease stomach aches and tired legs. And the acupressure point right behind the ankle is for sore feet or a charley horse. So can anybody do it? Bill has tennis elbow. Feel better? “Yeah, I think it does,” he says. Richard’s knee hurts. “No, didn’t do anything,” he says. Sandra has a pain in her foot. “It does feel a little, I can tell a slight difference, I think,” she says. Doctor Lee points out… even if you’re skeptical.. you can’t hurt yourself trying acupressure, and there are no side effects. One other pressure point that may be useful is supposed to stop sneezing. Instead of putting a finger to your nose the way most people do, try stretching your arm out and pressing on the inside of your elbow. For some people, the need to sneeze disappears. Go ahead and try this for minor pains, but remember… if you’re sick or hurt, go see your doctor. Patients undergoing cancer treatment often suffer from dry mouth, a condition known as xerostomia. Now researchers from the Naval Medical Center in San Diego think they have found an effective way to relieve this side effect: acupuncture. A previous study by the same authors showed patients who developed xerostomia after radiation therapy for cancer had increased salivation after acupuncture. This occurred even if they were resistant to standard drug treatment for dry mouth. Given the success in this group, the new study included patients who were not resistant to the standard treatment. It also involved a refined acupuncture technique involving a one step treatment. Fifty patients underwent an average of five treatments, which involved the use of eight needles. During the treatments, patients were also given a sugar-free lozenge to help stimulate salivation. Investigators found 30 patients improved after treatment, and 24 have noted improvements in their symptoms lasting for three months or more. Researchers are now suggesting regular acupuncture for the condition, consisting of three to four weekly treatments, followed by monthly sessions to maintain the response.